World number one shuttler, Datuk Lee Chong Wei and national swimmer Sow Yi Ting were selected as the Male Olympian and Female Olympian 2008 respectively at the Olympian Night held at Wisma OCM, here tonight. Chong Wei, 26, was selected based on his achievement as the only Malaysian athlete to win a medal at the Beijing Olympic Games in August. The Bukit Mertajam-born athlete won the silver medal in the men’s singles after losing to China’s Lin Dan in the badminton final at the 2008 Olympics. The silver medal was the second won by Malaysian athletes at the Olympic Games with the first silver won by the badminton doubles pair of Cheah Soon Kit-Yap Kim Hock at the Atlanta Olympic Games, United States in 1996. 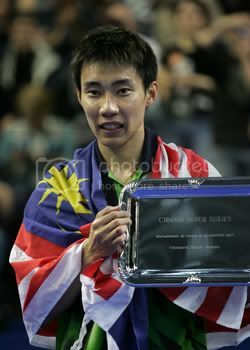 This was the first Olympian award for Chong Wei who was the sole nominee in his category. Chong Wei was not present to receive the award as he was in Alor Star, Kedah chasing a record seventh consecutive title in the National Badminton Grand Prix. He was represented by his brother-in-law, Tung Tok Seng. Meanwhile, Yi Ting was selected for the award for having broken the national record, clocking 2 minutes 23.71 seconds in the qualifying rounds for the 200m breast stroke in Beijing, which placed her in 19th position overall in the event. Her previous record was 2 minutes 27.80 seconds. The 24-year-old swimmer beat two other nominees, namely taekwando exponent Che Chew Chan who qualified for the quarterfinals in the women’s above 67kg category, and women’s shuttler Wong Mew Chew who qualified for the women’s singles quarterfinals in Beijing. Yi Ting was also not present for the award as she was attending to her studies in Arkansas, United States. She was represented by her father, Siow Kian Wah. Both the award winners received a trophy and RM10,000 cash each from Youth and Sports Minister Datuk Ismail Sabri Yaakob and Olympic Council of Malaysia (OCM) president Tunku Imran Tuanku Jaafar.